Bright Hill’s 25th Anniversary Year! Some of the poets and writers who will read for us at Word Thursdays this season! Plus: exhibits in the Word & Image gallery! Plus Great American Poets Day celebrations! Plus History Day! plus Veterans 7 Communities Day! Plus Bright Hill’s 25th Anniversary Celebrations! Word Thursday Readings Begin at 7pm. Mar. 23 Open Mic – celebrating Women’s History Month – All invited to bring 5-7 minutes of writing about and for women. Registration Begins Now for BHLC Summer Literary Workshops for Kids! Bright Hill’s 24TH Annual SUMMER Literary Workshops for Kids program will take place from late June through August 2017. Space is limited, so early registration is advised. Note: All Bright Hill Literary Workshops for Kids include writing and visual arts. Children ages 6-14 are eligible. High-school students and Middle-school students are eligible for the 3-D Poetry & Story Workshops, which are limited to only 7 students each & led by Bertha Rogers, Founding Executive Director & Master Teaching Artist, aided by Cain Rodriguez, Franklin. Workshops 1, 3, and 5, re led by Bertha Rogers, aided by high-school and college interns. There is always an exhibit and program for parents at the end of each session. Bright Kids Book Club takes place at different times during the year. Pre-Registration is required for all workshops and book club programs. High-school and Middle-school students are eligible for Workshops 2 and 4 (Poems & Stories in 3-Dimensions, using the new 3-D printer), limited to 7 students each and led by Bertha Rogers, Founding BHP Director & Master Teaching Artist, assisted by High-School Intern Cain Rodriguez, Franklin. Elementary through Middle-School students are eligible for Workshops 1, 3, and 5, led by Bertha Rogers, assisted by High-School Interns Felix Bridel, Cain Rodriguez, and others. SUMMER 1: “BUGS! HOW TO LOVE THEM!” Grades 1 -8 (Ages 6-14). 9 am – 2:30 pm for FIVE CONSECUTIVE DAYS in June. Morning & afternoon snacks included. Bring lunch. Students will research, write, and make visual arts projects based on astronomy. Includes a trip to the Cornell University Insect Collection (7 million insects!) in Ithaca on Day 2. Full scholarships for Delhi C. S. students. Full & partial scholarships available for students from other regional schools .June 26-30. SUMMER 2: “POEMS & STORIES IN THREE DIMENSIONS” (3-D PRINTING) / HS WORKSHOP – Grades 9-12, limited to 7 students only. 9 am – 2:30 pm for FIVE CONSECUTIVE DAYS IN JULY. Morning & afternoon snacks included. Bring lunch. Students will design, create, build, and print their own 3-d characters from their writing with our new 3-D printer. Full scholarships for Delhi CS students; full and partial scholarships available for students from other regional schools.. July 17-21. SUMMER 3: “THE TALKING TREES – HOW DO THEY SPEAK?” Grades 1-8 (Ages 6-14). 9 am – 2:30 pm FOR FIVE CONSECUTIVE DAYS IN JULY. Morning and afternoon snacks included. Bring lunch. Students will research, write, and make visual arts projects involving geography and fossils. Includes a trip to the NYS Museum in Albany Fossil Forest on Day 2. Morning & afternoon snacks included. Bring lunch. Full scholarships for Delaware Academy & CS students; full and partial scholarships available for students from other regional schools. July 24-28. SUMMER 4: “POEMS & STORIES IN THREE DIMENSIONS” (3-D PRINTING) / MS WORKSHOP – Grades 6-8, limited to 7 students only. 9 am – 2:30 pm for FIVE CONSECUTIVE DAYS IN AUGUST. Morning & afternoon snacks provided. Bring lunch. Students will design, create, build, and print their own 3-d characters from their writing with our new 3-D printer. Full scholarships for Delhi CS students; full and partial scholarships available for students from other regional schools. August 7-11. SUMMER 5: “ONE THOUSAND AND ONE NIGHTS: TRAVELING IN THE MIND AND HANDS TO THE ANCIENT NEAR EAST”. Grades 1 -8 (Ages 6-14). 9 am – 2:30 pm for FIVE CONSECUTIVE DAYS IN AUGUST. Morning & afternoon snacks included. Bring lunch. Students will research, write, and make visual arts projects based on Ancient Near East Art & Travel. Full scholarships for Delhi CS students. Full & partial scholarships available for students from other regional schools. Aug. 14-18. Saturdays, Noon – 1 pm; various months during the year; led by Linda Morgan and Wendy Burckhaus. Each student gets a free copy of the book being discussed, but must attend at least 2 of 3 sessions for the book. Free Program. 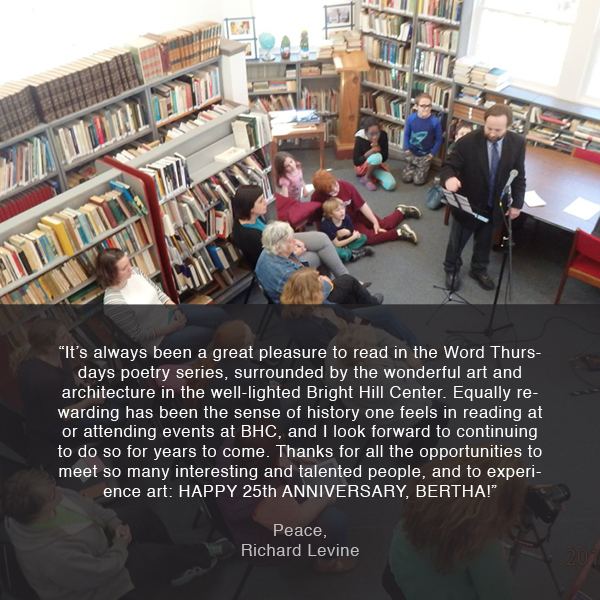 The Many Poets, Writers, Translators, Storytellers, Spoken Word Artists, Lyricists, & Playwrights who have shared their fine work from 1992 through 2014 at Bright Hill! Bright Hill Literary Center’s Word & Image Gallery, 94 Church Street, Treadwell, NY, dedicated to the exhibition of artworks that successfully integrate language and visual art, announces a call for exhibit proposals for 2016 & 2017. Postmark deadline for proposals, sent to the Word & Image Gallery, Bright Hill Literary Center, POB 193, Treadwell, NY 13846-0193, November 30, 2015. Self-addressed, stamped envelope for return of materials. Artist will supply Bright Hill with a list of all artworks to be included in exhibit, plus media, and sale price (60 percent of exhibit works must be for sale). Bright Hill will prepare labels for walls (our wall labels include name of work, medium, and price). Bright Hill will e-mail press releases with accompanying jpegs to more than100 print and broadcast media throughout New York’s Catskill Mountain Region, the Central Leatherstocking Region, and the Capital Region—if artist has specific recommendations for press releases he/she may give that information to BHP, and BHP will send releases to those addresses. Bright Hill takes a 30 percent commission on sales; payment will be made to artist at completion of exhibit. WE RECOMMEND THAT INTERESTED ARTISTS VISIT THE GALLERY in order to address particular spatial concerns.